The New Jersey-bound plane, United Airlines Flight UA4941 (ALB to EWR) was evacuated after a passenger spoke of a bomb Wednesday morning. 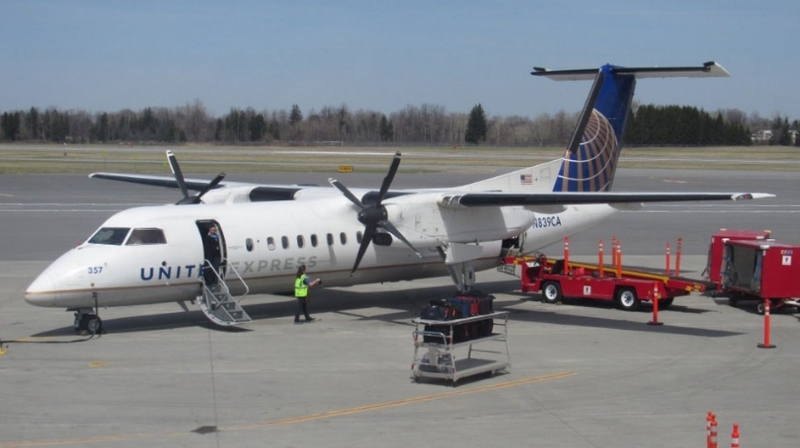 The aircraft was a Bombardier Dash 8 Q300, registration N839CA, and was being operated by CommutAir. Albany County Sheriff Craig Apple told that the flight, which was headed for Newark, N.J., was grounded by the bomb scare around 6 a.m. Wednesday. Passengers and baggage were removed after someone said a man “uttered the words ‘bomb’ to another passenger.” The flight crew was alerted, and the pilot immediately ordered everyone off the plane. Bomb-sniffing dogs and the FBI anti-terrorism task force were dispatched to the airport to search the plane. All passengers and luggage were being re-screened. “He uttered the words bomb to another passenger” who alerted the flight crew, Albany County Sheriff Craig Apple said. United Airlines Flight 4941 departed about two hours after its originally scheduled take off was delayed.